Making skin look like skin is one of Rihanna’s top priorities when it comes to makeup. She wanted to create an easy way to seamlessly blend Pro Filt’r Instant Retouch Setting Powder. 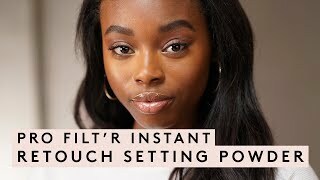 Use to apply Pro Filt’r Instant Retouch Setting Powder as the final step of your Fenty Face. Dip brush into powder, tap off excess, and dust over foundation, concealer, and contour to set. ARTISTRY PRO TIP: For more of a soft matte filtered effect, use brush in a patting motion to help press powder into skin. POWDER PUFF SETTING BRUSH is rated 5.0 out of 5 by 9. Rated 5 out of 5 by Jean in chi from This is the best brush you will ever buy! The lipstick stays, the powder is light but offers great coverage and the brush feels like a feather sweeping over my skin. I literally gasped when it touched my skin. Awesome! Rated 5 out of 5 by Beth93 from Just beautiful Not only did the make up come so beautifully packed, all the products are amazing! Rated 5 out of 5 by ChicShirl from Amazing Powder Brush Powder Puff Setting Brush is as described...has a very plush feel to the bristles and feels amazing when applying the Setting Powder, No shedding! Rated 5 out of 5 by Sweetesthoney49 from Hands down Favorite This brush is life ! I have never felt a cloud before. Now I know . Rated 5 out of 5 by TinaRenee from Have to get it This brush is worth buying! As is all the Fenty brushes. They are so soft and apply on any makeup perfectly. My next purchase is the sponges!! Rated 5 out of 5 by Deee from Super soft brush. This brush is a winner, so I bought two. It picks up power like a magnet. Rated 5 out of 5 by MommaBear919 from This. Brush. Love it! It is soft and applies products evenly. I use one for Pro Filt’r setting powder and another one for Pro Filt’r foundation.